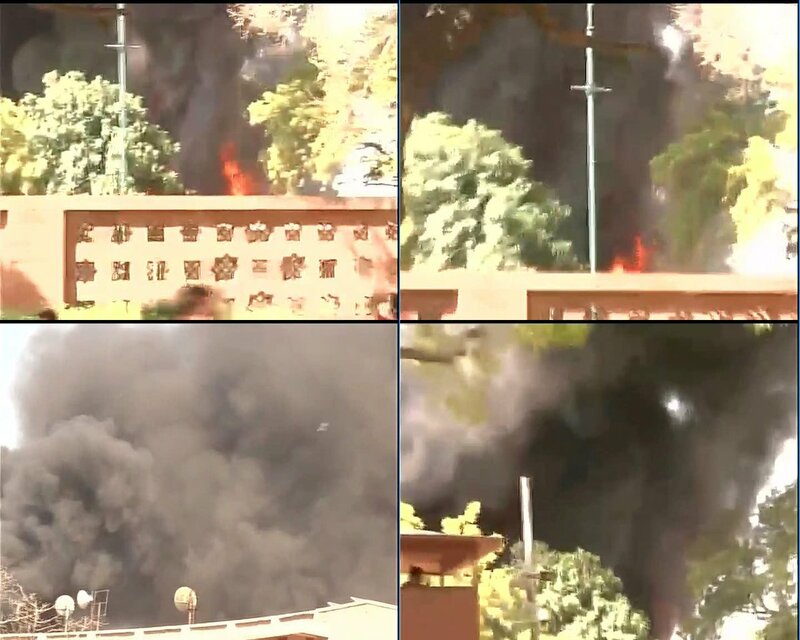 New Delhi(Indilens Web Team): Fire broke out at the Parliament premises on Sunday afternoon. The fire was started due to a short circuit in the air conditioning unit. Concerned over the fire in Parliament complex, the Home Ministry on Sunday sought report from Delhi Fire Services, Delhi Police and CPWD and asked them to explain the reasons behind the fire. The Home Ministry told the three organisations and New Delhi Municipal Corporation to send respective report on an urgent basis, a Home Ministry official said. The organisations were told to inform the Home Ministry the reasons for fire, whether there was any lapse on their part and action taken to prevent such incident in future. President Pranab Mukherjee expresses serious concern over the fire in Parliament Complex; asks for an urgent enquiry into the cause of the fire. The fire broke out near Visitors Entry gate no 8 near the parking lot. Seven fire tenders arrived at the spot and have contained the blaze. The situation is under control but the fire is yet to be extinguished. According to reports, shopkeepers alerted after the fire first broke out. Delhi: Fire- breakout in Parliament premises; details awaited. Delhi Fire Service Director A.K. Sharma on Sunday said there have been no injuries in the fire which broke out inside the Parliament complex and added that the mishap took place due to welding spark. Earlier: Visuals of fire that broke out in Parliament complex; fire under control now. “The fire was reported to control room at 2:10 in afternoon. Ten fire teams were responded. I’m confirming that there is no fire and no injury. Maintenance work was going on in the AC plant in Parliament premises, and fire broke due to welding spark. Ordinarily it happens when adequate precautions are not taken,” said Sharma. This is the second incident of a fire breakout in Parliament premises in last four days.